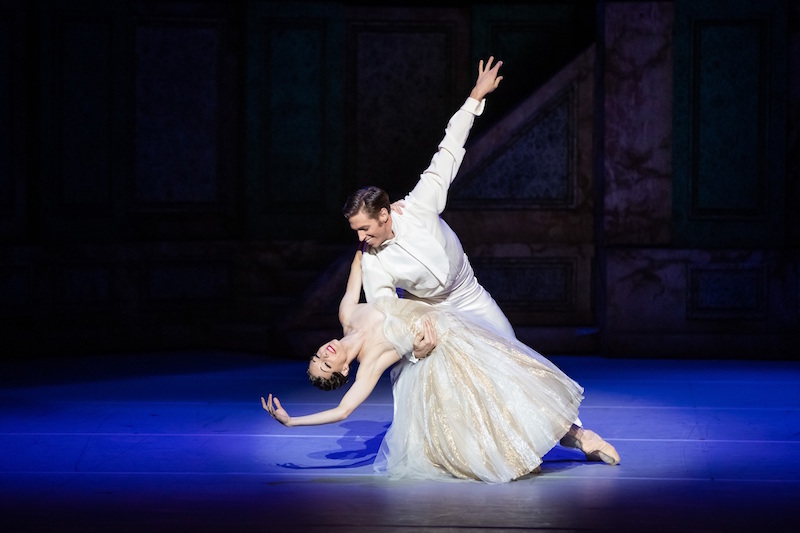 With its gorgeous design, luscious pas de deux for Cinderella and the Prince, and genuinely funny choreography for the stepmother and stepsisters, Alexei Ratmansky’s Cinderella is a perfect production for the festive holidays. Created for The Australian Ballet in 2013, it still feels upliftingly fresh and fun. 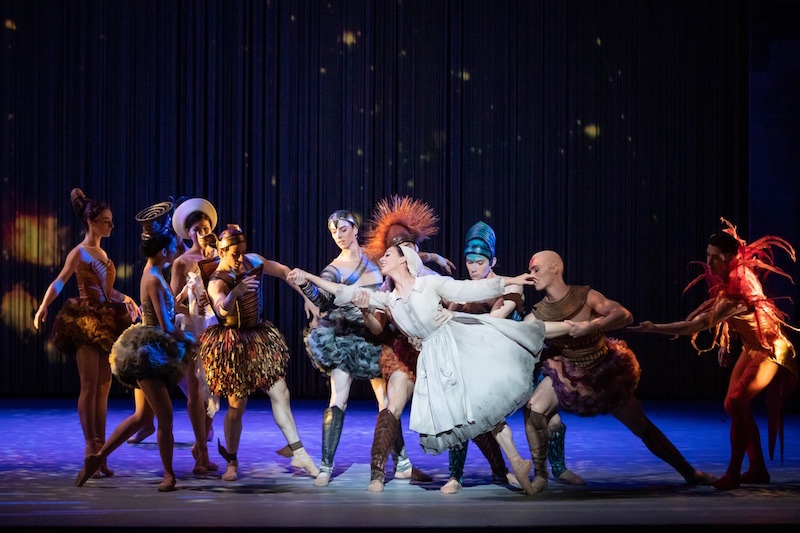 Ratmansky has dispensed with the traditional pumpkin and rats; instead the Fairy Godmother summons a constellation of celestial bodies to send Cinderella to the ball. There are a few other small changes along the way, but, essentially, he has kept the story intact, drawing on references from Surrealism to help tell it. In the kitchen, where Cinderella (Leanne Stojmenov) works for her stepmother and stepsisters, there is a pink-lipped Dali-esque sofa. Later, when the stepsisters are trying on the lost glittery slipper (rather than a glass shoe) left behind at the ball, there’s a small table with female-shaped legs in high heels, while the stepsisters don hats shaped like a shoe. A clock face inspired by Dali’s melting clocks features strongly. At the ball, as midnight approaches, topiary bushes in the garden become giant ticking metronomes and the moon becomes a clock. These abstract, surrealist effects add a slightly nightmarish quality to the piece, which suits it well, helping increase the tension. It also fits well with Prokofiev’s dark, dramatic score (extremely well performed by the Opera Australia Orchestra under TAB’s Music Director and Chief Conductor Nicolette Fraillon). The ugly stepmother and two stepsisters – here called Dumpy and Skinny – provide a glorious injection of hilarity. They aren’t ugly or particularly nasty (aside from ripping Cinderella’s portrait of her beloved dead mother) but are ungainly, silly and pushy, tripping over things, sniggering at each other, and generally making fools of themselves at the ball. Ratmansky’s choreography for them is deliciously witty; in fact, laugh out loud funny at times. The stepmother, brilliantly danced here by Dana Stephensen, lashes out in a tantrum, her feet flying weapon-like at the face of the man who messes up her wig, then falls flat on her face when one of her daughters treads on her long train at the ball. The sisters – Jill Ogai as Dumpy and Ingrid Gow and Skinny – fumble and tumble, with drooped shoulders, bent knees and clumsy leg splits. For the other characters, Ratmansky uses an expressive, classical style but plays with the line of the body, with off-axis balances, unusual lifts and surprise movements that embody emotion and narrative. It brings an exciting, unexpected element to a very familiar story and helps illustrate character and intent. There is some beautiful, slickly shaped work for the corps at the ball, and the pas de deux for Cinderella and the Prince are dreamily lovely. With set and costumes by Jérôme Kaplan, the production is visually sumptuous. Set between the two world wars, on a stage with a false proscenium to accentuate the theatricality and fairytale quality of the piece, Cinderella’s grey rags are transformed into a floating white and gold New Look dress. 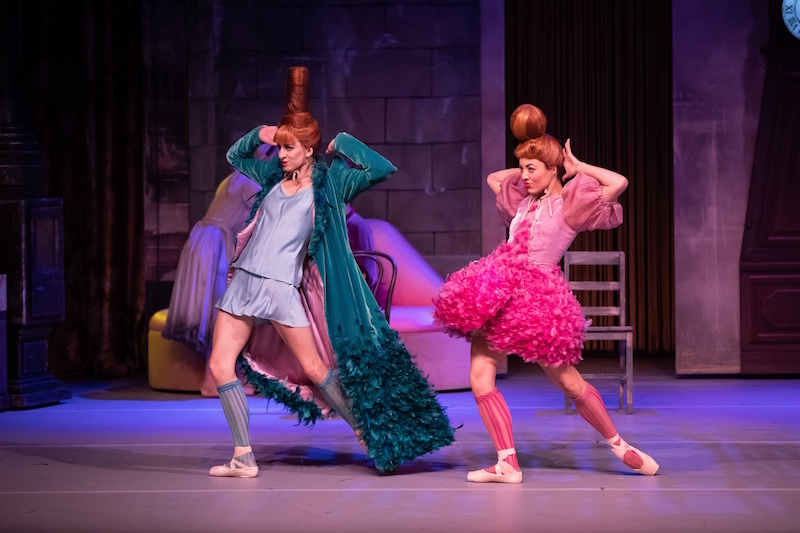 The stepsisters, meanwhile, wear short dresses with rounded bubble skirts and flamboyant hair-dos, with matching long socks in their pointe shoes. Arriving at the ball, they are shocked to discover all the women in chic trouser-suits in soft, dark, muted shades and rush off to get changed, only to return in trousers to find the court has copied Cinderella and the women are now wearing dresses. It’s a lovely touch. The rock star Prince (Ty King-Wall) appears in shining white. Having made the required dramatic entrance, he is bored rigid by those at court, until he catches sight of Cinderella and falls immediately in love. Mind you, that doesn’t stop him walking straight past her without a glance when her magical dress has returned to a tatty grey frock. The Fairy Godmother meanwhile has no magical wand. Instead she is unassumingly dressed, with a look of Nanny McPhee about her, arriving to comfort a distraught Cinderella after her mother’s portrait has been destroyed. The idea of having the Fairy Godmother summon celestial bodies – the sun, moon, planets and stars – to help transform Cinderella is not immediately clear dramatically (my plus-one was confused as to what was happening) and the constellation section is somewhat over-extended but Cinderella’s actual transformation is magical. The Prince’s search for Cinderella, during which he encounters various temptations and challenges, also feels a little tacked on and not entirely convincing, but overall Ratmansky’s production is an enchanting take on the story. On opening night, Leanne Stojmenov was a luminous Cinderella, evoking her grief and then gradual joy in heartfelt, truthful fashion without resorting to sentimentality or melodrama, and so secure was her technique and she seemed to float across the stage in the pas de deux. The production marks her final performance for TAB after 18 years with the company, and she is certainly leaving on an exquisite high. Dana Stephensen, Ingrid Gow and Jill Ogai were a complete delight as the stepmother and stepsisters, making them silly yet somehow lovable, with Brodie James entering the fun in fine fashion as their dancing teacher. Ty King-Wall was a dashing Prince, capturing the character’s privilege, celebrity and ennui, and then conveying the impact of unexpected romance and the softening of his personality. There were times when a little more effortless fluidity would enhance his performance, but he partnered Stojmenov sensitively and their final pas de deux was sublime: a shimmering, happy ending to an uplifting night. As The Australian Ballet premieres its new production of Spartacus, we take a tour through the region in which the true story of the famous gladiator-rebel took place. One of the world's most beloved fairy-tales is a magical experience for all ages in this production.